On the hour it chimes 16 times and has a gorgeous. It is brass (?) 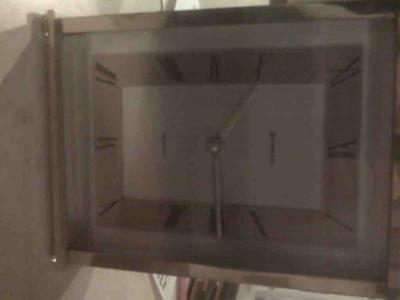 with a glass front and metal face and roman numerals. It is very heavy if you pick it up. It has the words “Benchmark,” “Westminster,” and “west Germany” on the front. It runs on a 1.5 volt battery. It was my grandmother’s and now my mother has it. I would like to buy one to keep in my home so I will always feel connected.